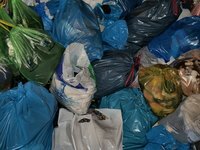 Plastic bags like those obtained when shopping are often thrown away, but you can easily recycle them and create a useful product at the same time. You can make a plastic bowl that does not require the use of chemicals and does not produce harsh fumes. Shred a collection of plastic bags. You will need quite a few plastic bags because as they melt, they will shrink considerably. For a small bowl, fill one plastic bag full of bags and that should give you what you need. Shredding the bags will help the texture of the bowl be smoother. Pour about a half cup to a cup of vegetable oil in an old pot that you no longer use for cooking. Use just enough oil to help the plastic not stick to the pot as it melts. Heat the oil on the stove at about medium heat. Add the shredded plastic bags to the oil and use a wooden spoon to stir. Continue to stir as the bags melt to prevent any sticking. If it looks like there will not be enough plastic, you can add more shredded bags. You can add additional vegetable oil to prevent the bags from sticking as they melt. Stir the bags as the melt. If the bags are not melted enough, they may resist sticking together. You are looking to have a single smooth melted blob of plastic. Work out any lumps with an old fork. Pour the melted plastic into the bowl. If the plastic is not melted enough to pour, that is OK. Simply use the wooden spoon to serve it out into the mold. Use the spoon to smooth the plastic into shape inside the mold. Allow the bowl to cool before use. You can put the bowl mold into the refrigerator or freezer to allow it to cool faster if desired. Once it is cool, the plastic bowl should pop out of the mold.